While browsing Facebook I came across a sponsored post by Alaska Airlines which is rather common. The focus, gay travel, was new. Or at least I hadn’t seen it before. When I clicked through the ad I found that Alaska has an entire web page on their site devoted to discounts to various LGBTQ Pride events. The discounts are short term (I’m assuming only over the Pride weekend/event) and relatively small (7% or 10%), still a nice acknowledgement and support of the LGBTQ community. Clearly Alaska has made promoting equality as a company a priority; they score a perfect 100 on the Human Rights Campaign’s Corporate Equality Index. Alaska is one of only five airlines to score a perfect 100. 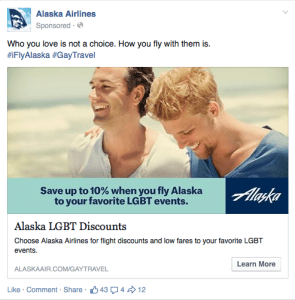 Alaska has been a sponsor of the Seattle Pride for a number of years. They are also progressive in their recognition of same gender relationships/marriages and insurance practices. 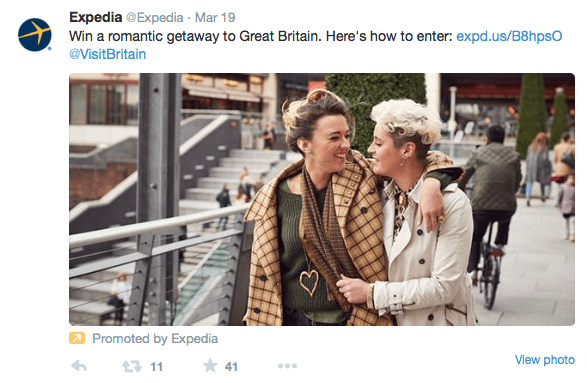 Apparently Expedia is also running an ad campaign aimed at LGBTQ travelers on Twitter (although it won’t change my opinion of Expedia) Of note, they scored a 90 on the HRC CEI. If you were wondering, the five airlines that scored a perfect 100 were Alaska, American, JetBlue, United and Virgin. Boeing also scored a perfect 100. Check out the full report. Well said. I think it is a great offer for everyone. Plus I imagine there might be a few straight people that would want to go to Pride; they are usually amazing parties!